The Boxing Rock Brewing Company is located in Shelburne on Nova Scotia’s South Shore. Exploding on the Nova Scotia scene in 2013, Boxing Rock’s team produces innovative and traditional beers, offering a wide range of styles and offerings for every taste and preference. According to local folklore, Boxing Rock is where bickering seamen were left by their captain to sort out their differences. The choice: box until only one could return to the ship or shake hands and share a beer. British soldiers stationed in India receiving their daily beer ration would never have expected this. 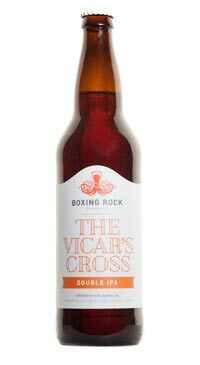 The Vicar’s Cross has all the bitterness a double IPA demands, yet it is remarkably smooth and well balanced.